With the flick of a switch, Philips Electronics may have just dramatically lowered America's electric bill. 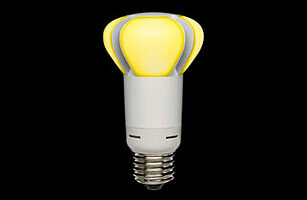 In September the Dutch electronics giant became the first to enter the U.S. Department of Energy's L Prize competition, which seeks an LED alternative to the common 60-watt bulb. Sixty-watt lights account for 50% of the domestic incandescent market; if they were replaced by LED bulbs, the U.S. could save enough electricity per year to light 17.4 million households. If Philips wins the L Prize, it will claim a cash award and federal purchasing agreements worth about $10 million.